Whether you’ve had food allergies for years or are newly diagnosed, dining out with food allergies and intolerances requires a plan. 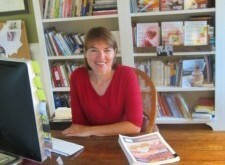 We’ve been talking with food-allergic editors and bloggers to get tips and advice from those “in the know.” Earlier this year, we connected with Alisa Fleming, who’s allergic to dairy, and this month, we sat down with Alicia Woodward, Editor of Gluten Free & More (formerly Living Without magazine), who eats a gluten-free diet. Alicia understands that people with food allergies and intolerances have the same need (avoidance of their “trigger foods”) and ask the same questions (about ingredient lists, food preparation techniques, the possibility of cross-contamination, etc.) We asked how she chooses restaurants and ensures that she receives meals that she can comfortably eat. We also requested her tips on how people with food allergies and intolerances can successfully find restaurant and meal options. You eat a gluten-free diet. Why is that? Do you have celiac disease? No, I don’t have a celiac diagnosis. I’ve been tested 3 times because I had osteopenia in my 40s, there are people in my family with thyroid and gut issues, and my son has real problems with ingesting gluten. However, I do believe I’m gluten sensitive. I went gluten-free when I became editor in chief of Gluten Free & More magazine. That was in 2008 and I did it because I wanted to “walk the walk.” I noticed I felt better. Now when I get “glutened, “I get mouth sores, achy joints, that sort of thing. Frankly, I’m not great with dairy milk, either. If I drink dairy milk, it has to be lactose-free, and I can only eat real dairy cheese in moderation. Being gluten-free is more than a diet, it’s a way of life for me. As the editor of a food allergy/intolerance-focused magazine, what are your top tips for people with food allergies/intolerances/celiac disease to help them dine out more comfortably? • Do the research. Know exactly what you’re walking into so there are no surprises. • Choose simple items on the menu – without sauces, no casseroles or crusted-over desserts – unless you absolutely, positively know what’s in them. • Develop good relationships with a few local restaurants/chefs who know you, understand your allergies and sensitivities, and happily accommodate you. Frequent those places. • Always speak up about your food issues (firmly, pleasantly) so the chef, manager, and waitstaff understand your dietary needs. • And don’t be afraid to leave if you’re not comfortable. • When a restaurant treats you well, always say “thank you” – and then tell your friends. comfortable that you’ll receive a gluten-free meal? In my opinion, choosing a restaurant that has a gluten-free menu sets the stage for a nice evening. I know the place at least has the sensitivity (plus the knowledge and awareness) to create a separate menu for people like us. That’s a good sign. I think speaking up is the most important thing. Letting the server know your allergy or sensitivity and then paying attention to make certain your food is right – no croutons on the salad (obvious stuff like that), your plate comes separately, your server is paying close attention and knows his/her stuff, that sort of thing. Increasingly, restaurants are adding gluten-free menus. Do you find it difficult to determine which restaurants with gluten-free menus truly “get it,” and which are trying to leverage the gluten-free trend and attract more diners (but don’t have significant protocols/experience/training around food allergies and intolerances)? Once I’m sitting down in a restaurant and ordering, it becomes pretty clear to me if the place “gets it” or not. I can usually roll with it because I’m pretty savvy about safely ordering off most menus. I prefer restaurants that serve farm-fresh, local fare – simple, wholesome ingredients that are organic and unprocessed. I love pure foods that are made simply and seasoned simply so that the flavor of the food stands on its own. I don’t eat a lot of meat but when I do, I always prefer free-range, grass-fed, humanely-treated animals. My best bet is a big green salad with lots of different fresh veggies in it, along with some thinly sliced meat or maybe some shrimp with a vinaigrette dressing on the side. I frequently recommend AllergyEats to GF&M magazine readers. It’s a go-to app and site for anyone with food allergies and sensitivities. I check out menus online and use my phone. When I travel for work, I’m often in a hurry and in a strange city without a car. In that case, I might dine at my hotel’s restaurant or at one within walking distance, just out of convenience. Then I order very carefully and as cleanly as I can. Do your homework. Plan-prepare-plan. Most important: Don’t let your food issues keep you from living a rich, full, happy and super-delicious life! A note to our Blog readers: Did you know that AllergyEats is the leading guide to dining out with food allergies in the U.S.? We can be easily accessed via our smartphone app or at our website, www.allergyeats.com. To find a restaurant on the AllergyEats app or website, simply select your allergens and search by town/state to see how the food allergic community has rated restaurants in that area. Please take a minute to add your own restaurant ratings. Each new rating helps make AllergyEats a more valuable tool for our food allergy and intolerance community. While I agree with the tips presented in this blog, I have a hard time connecting with the perspective of someone who avoids certain foods due to a “way of life” or because certain foods make them feel not-so-pleasant. I am a mother of two young children with multiple life-threatening food allergies, including peanut, treenuts, dairy, shellfish, mustard and sunflower. Eating out is a real threat and a scary prospect for us. I am all for eating clean, organic, non-GMO foods, but when we go to a restaurant, I am less concerned if the meat comes from free-range, humanely treated animals and more worried that one or both of my kids could lose their life. Plenty of people on a gluten free diet have to be gluten free to 20ppmillion or less (a very small crumb) While they don’t die instantly they do pay a very high price medically with Many other diseases and some do get cancer and risk death. There are also many people on a gluten free diet who also suffer other intolerances or anaphylactic allergies, like my daughter with celiac disease and anaphylactic allergies to tree nuts and pinapple. People who collect allergies are learning through the small amount of research done so far that GMOs have a lot to do with why they keep getting more allergies. They also find their digestive system compromised and need to support their health with clean food choices. I find your comments ignorant , self absorbed and uneducated .